Urban areas or cities are often centres of economic growth and development. However, it is difficult to acquire economic growth data, such as GDP or GNP, at an urban level. There is no simple indicator of economic growth that is tailored specifically to the urban areas and equivalent to GDP. The interpretation of GDP per capita should be dealt with care as it does not take into account commuting flows that occurs across the regional boundaries. Some of the patterns observed at regional level hold true for cities and urban areas in the BSR. In particular disparities between cities in the east and west, as well as core-periphery patterns (between large and small cities) can be identified. In general, urban areas stand out as relative prosperous areas in all countries in the BSR. 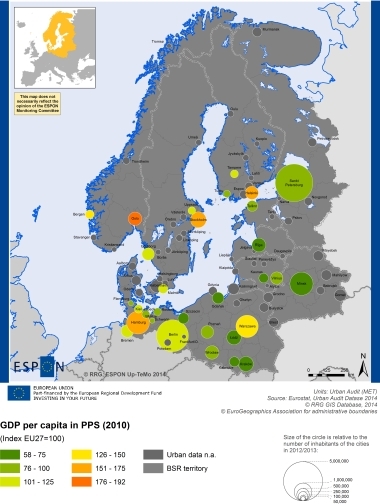 However, in the most eastern cities, Minsk, St. Petersburg and Polish cities (except Warsaw), the level of urban GDP is far below that in the western cities. The urban analysis shows that the cities with the highest levels of unemployment are Narva, Riga, Kaunas, Berlin, as well as many smaller cities in the Baltic States and Finland. This picture would probably be even worse without the trend of outmigration for some of these cities, the problem as such seem to be one of weaker long term productivity. Helsinki, Tallinn and Vilnius are the exceptions in the Eastern part of the BSR, while many cities in the west are doing generally well. St. Petersburg reports low levels of unemployment, as does Minsk. However, as institutional systems differ, these data are not strictly comparable with that for EU-BSR cities. Looking at trends in unemployment (2004-2011), Riga seems to experience a large increase in unemployment, along with large cities like Copenhagen and Uppsala. Some smaller cities in Estonia, Latvia and Lithuania also show negative trends. Helsinki, Stockholm and Berlin register strong improvements, as do many cities in Denmark and Germany. As for other indicators there is a lack of data for many cities, in this case notably Norway, Poland and Finland (as for Russia or Belarus).